CSUN (25-16, 4-10 Big West) couldn’t overcome UC Riverside’s early runs, losing 5-3, despite a ninth inning rally attempt. The game was 5-1 through eight innings until a couple of ninth inning RBIs by Matador batters, senior Chester Pak and pinch hitting freshman Albee Weiss. The Matadors pitching and defense allowed five one-run innings, giving the offense chances throughout the game. CSUN had four of their eight hits come in the ninth inning, while Riverside had 12 hits total and eight of those hits occurred in the first four innings. 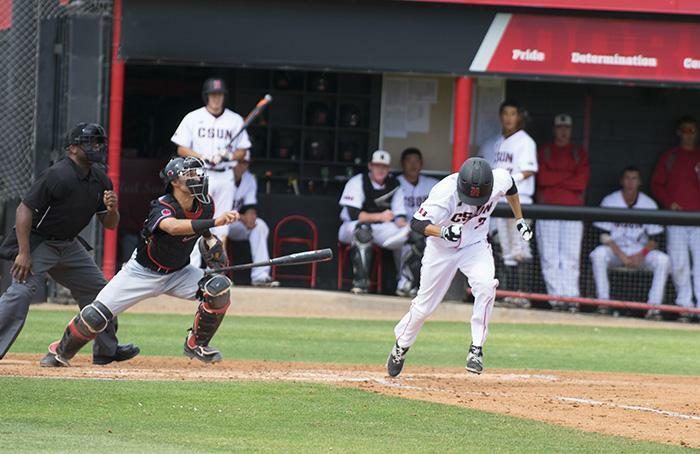 CSUN had plenty of opportunities to win the game, but did not capitalize. There were four innings where the Matadors had two or more runners on base with only one out, including a ninth-inning-bases-loaded opportunity. Though senior starting pitcher Jerry Keel had eight strikeouts, he received the loss (4-5) pitching 6.1 innings, allowing four runs and three earned on nine hits. First out of the bullpen was junior relief pitcher Angel Rodriguez, who allowed his first walk and earned run of the season in the eighth inning. UC Riverside’s freshman Adonis Morrison had a lot to do with the Matadors pitching woes. Morrison went 4-for-4, scoring two runs and two RBIs, including a fifth inning career-first solo home run. UC Riverside’s senior starting pitcher Kevin Sprague also had a lot to do with stifling the CSUN batters early. Sprague who picked up the win (3-4) pitched 7.1 innings, allowing four hits and one earned while striking out six batters. With the series tied 1-1, the final game and winner of this Big West Conference series will be decided Sunday at 1 p.m.
On the mound for CSUN will be junior Rayne Raven (5-3) who has a 1.98 era this season.